Discover Kenya’s African scenic beauty and wildlife! Experience this amazing safari where you will go around the best spots in Kenya. Have an early morning game drive in Maasai Mara National Reserve, look for amazing bird species at Lake Nakuru National Park, have a nature walk in Lake Naivasha, and embark on an evening game drive at Amboseli National Park. Surely, this safari trip will give you an experience that you will never forget! On this safari, you will stay at several campsites in Maasai Mara National Reserve and Amboseli National Park. You will also be accommodated at a budget hotel while you are at Lake Nakuru National Park or Lake Naivasha. Depart from Nairobi in the morning for Amboseli National Park at the foot of the snow capped Mount Kilimanjaro, Africa’s highest mountain. Afternoon game drive. Dinner and overnight at a lodge. You will spend a day in this photogenic park. Scheduled morning and afternoon game drives. Amboseli Nationa Park is one of the most popular wildlife parks sanctuaries in Kenya. It is situated close to Kenya and Tanzania border. The Park lies at the foot of Mount Kilimanjaro, the highest mountain in Africa (5,896 meters) whose snow-capped summit presents a splendid view on clear days. Amboseli National Park is often referred to as the home of elephants, as some of the largest elephant herds are found here. The Game Park also contains vast groups of zebras, wildebeests, giraffes, buffalos, hippos, and antelopes. Also to be found in Amboseli are lions, leopards, cheetahs, rhinos, and many species of plain game. You will depart from your lodge soon after breakfast and proceed to Lake Nakuru via Nairobi. Lunch en-route followed by late afternoon game drives. Lake Nakuru National Park is famous for over 400 species of birds. The lake itself is a soda lake on the floor of the rift valley. The sight of millions of flamingos is quite spectacular. From a distance the lake appears ringed in pink. The Lake has also earned a reputation as an important haven for endangered species, particularly the Rothschild giraffe and the black and white rhino. Lions, water buck, buffalo, and baboons are all residents here. After breakfast, you will depart for Maasai Mara, the land of vast migrating animals. Arrival will be in time for lunch. After lunch embarks on a game drive. A full day spent exploring Masai Mara in search of the Big Five animals. 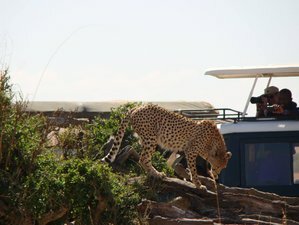 Morning and afternoon game drives are offered. Pre-breakfast game drives, then return to the lodge for breakfast. You will return to Nairobi where the tour and safari ends. This safari will take place at Amboseli National Park, Lake Nakuru National Park, and Maasai Mara National Reserve in Kenya. The safari bucket list for Kenya includes seeing the Great migration in the legendary Maasai Mara, Amboseli’s unforgettable views of Mount Kilimanjaro, and Samburu’s leopards. Encounter fascinating cultures in authentic Maasai villages and taste the flavors of Africa, India, and Europe in the melting pot that is Swahili culture. Kenya’s biggest attraction is the natural movement of mega-herds, wildebeest, zebra, and gazelle, following the summer rains and sweet grasses in an annual pilgrimage called the Great migration. Depending on when your Kenya safari takes place, you may witness the life-and-death struggles of the Mara River crossings or dramatic encounters with Africa’s top predators on the open plains. Kenya offers a holiday for every traveler. From unforgettable Kenya family safaris that offer child-friendly activities and services, to exclusive hideaways for romantics, from adventurous honeymoons to small groups of friends and family celebrating a milestone anniversary. Whatever type of traveler you are, there’s not much that beats a Kenya holiday. The standards of service are high and Kenya’s top destinations offer luxury accommodation ranging from lavish, colonial-style lodges to funky boutique hotels and amenity-packed resorts. While on safari, you have a full board meal basis. Vegetarian, vegan, gluten free regular meals that include meat and fish, as well as halal food, are catered for. If you have special dietary requirements, it's a good idea to let Dallago Tours Kenya Tanzania Ltd know when you make a reservation. In the fifth day of the safari tour, optional hot air balloon safari can be arranged at an extra cost. You also have the option to go on a boat ride in Naivasha and visit a Maasai village during your safari adventure for an additional fee. Please book your flight to arrive at Jomo Kenyatta International Airport (NBO).